The richest league in the world received confirmation of their extraordinary £8billion-plus haul from TV rights on Thursday, yet couldn’t agree the way forward to help away fans. The 20 Premier League clubs, despite being awash with money over the next three seasons (£5.1bn domestic and £3bn overseas), spent more time debating the issue of assisting travelling supporters than any other item on the agenda during a five-and-a-half-hour meeting in London. The big clubs, as usual, were against the sensible proposal to cap away tickets at £30, although Everton spoke loudly in favour. In a secret ballot, seven or eight clubs are understood to have opposed the capping — those led by greedy Arsenal who charge away supporters the most — leaving the Premier League short of the 14-club majority needed to make such changes. The proposal will be back on the table at the March meeting after clubs voted heavily against the compromise of a funding arrangement where clubs would get money to help travelling supporters which they could use in varied ways. Norwich's new chairman Ed Balls made his debut on Thursday at the Premier League clubs summit. And former Chancellor Balls, a veteran of Cabinet scheming, leaks and attempted political coups, would certainly have found it different from talkative Whitehall that it’s somehow accepted by the clubs that only the all-powerful executive chairman Richard Scudamore or his on-message spin doctors speak about the meeting. Balls is said to have made a strong contribution but sadly no one mentioned his Eddie the Eagle-themed sponge cake from Sport Relief Bake-Off the night before. Capping away tickets at £30 is a clanging no brainer in PR terms and has little downside but the Premier League clubs are missing out on a historic opportunity to right a wrong. When a few hundred fans marched in the summer sunshine on the Premier League’s headquarters, an expensively understated block in Marylebone, in 2013, one particular banner lodged in the memory. Nabbing the title of a Manic Street Preachers song, it proclaimed “If you tolerate this, then your children will be next” alongside a picture of a priced-out father dragging his son into the pub to watch a match. It was this picture, held aloft on a march down Baker Street that featured representatives from some 40 clubs to a tinny soundtrack of Public Enemy’s Fight the Power on a portable ghetto-blaster, that sprang to mind when Ian Ayre attempted to defend Liverpool’s new pricing policy at Anfield this week. Which, given that TV income has risen exponentially and now gives clubs certainty that they will receive at least £100m for each of the next three seasons assuming they can avoid relegation, is among the more asinine reasons given for continued price rises that outstrip inflation by several hundred per cent since the dawn of the Premier League era. It also contained worrying signs of trying to drive some sort of wedge between armchair fans and match-going ones (notwithstanding the fact they are often one and the same). And it betrayed the mindset of a breed of Premier League owners who believe they can combine success on the pitch with profits off it. “Of course everybody would like the tickets to be cheaper, including us, but that’s not an option for us right now,” said Ayre. To which the only sane response is: if not now, then when? The huge increase in television income, to at least £8.3bn over three years once international deals are factored in, gives Premier League clubs a historic opportunity to think strategically about their futures. At a time when matchday revenue contributes an ever smaller percentage of their total income, it appears to be one they are determined to pass up. This could have been a cleansing moment – a much-needed opportunity to reset the relationship between clubs and their match-going fans. Instead, it could yet become corrosive. In response, it feels as if something has shifted. The anger over pricing is no longer the minority pursuit of the few but a mainstream concern among many season-ticket holders. In the 1980s, we paid less but were packed on to terraces in unsafe, unsanitary conditions – piss running down the back of our jeans, crushed against barriers. Once Lord Justice Taylor recommended all-seater stadia – largely paid for out of public funds – clubs took the opportunity to start ratcheting up prices. Today, there is a more diverse, more comfortable crowd – but one that is paying through the nose. Football has become a premium product and it is an almost irrational fear of undermining that status that seems to have paralysed decision-making among Premier League executives. Introducing a cap of, say, £30 for away tickets is a clanging no-brainer in PR terms and in reality has little downside. It would head off further protests, at least for the time being, and would at least show a willingness among the cloth-eared executive class to listen to their consumers. It addresses a clear need, with a fifth of all away seats unsold last season compared to near sellouts in the home ends, and maintains the atmosphere that the Premier League’s executives have been able so skilfully to monetise around the world. Anyone who doubts how integral the atmosphere and pageantry generated between rival supporters is to the overall appeal of the Premier League should visit the vast studios in west London from which it is packaged, sold and broadcast to the world. Shots of passionate fans in packed stands, their chants and cheers turned up high in the audio mix, are endlessly recycled as one of the Premier League’s USPs. An away ticket price cap would at least be a start. It would tell match-going fans, unloved and feeling the pinch as matches are shunted around the calendar for the benefit of television (a feeling that will only intensify next season with the introduction of Friday night football), that they have not been completely abandoned. And it would barely cost clubs a penny in the context of their vast rises in income. The fear of the big clubs that oppose the idea is that it would somehow enrage their own home supporters who were paying more and remove their ability to set their own prices. It is not a matter of cost but of control. There is little evidence for the former and most fans would surely understand, and support, the fact that away fans across the league were benefiting. Instead, those clubs opposed – Arsenal, Manchester United, Manchester City and Chelsea among them – would rather see an increase in the so-called Away Fans Fund that would allow them to subsidise travel and other schemes for their own supporters. As with so many other areas – from grassroots facilities to supporter ownership, from coaches in schools to community investment – this mind-boggling Premier League TV deal offers a glorious chance for a one-off corrective. It provides an opportunity for clubs to maintain their competitive advantage over other European leagues while reconsidering their belief that they must squeeze every last penny into wages and transfer fees or take out profits. Stretch pricing has become the mantra of the Premier League marketeers. And while there is nothing wrong with high corporate prices at the top end supposedly subsidising those at the bottom, the reality is that in most cases the former has happened but the latter has resolutely not. It is not an original point, but fans who cannot change their team as simply as they could switch supermarkets for a cheaper tin of beans have been taken for granted for too long. Premier League clubs have become conditioned to supporters paying ever higher prices and still filling their grounds, or gradually replacing those who can’t with those who can, devoting their energy instead to growing their overseas fanbase and chasing ever more lucrative commercial deals. Faced with the prospect of middle-aged crowds growing old together, most Premier League clubs have taken action to ensure that there are a greater proportion of kids represented. The crunch point is now slightly later, with fans who enter their teens and 20s no longer able to afford to go. The profile of the sport is changing and with it the atmosphere within stadiums. Meanwhile, pricing schemes for both season tickets and match-by-match purchases have become ever more complex, with endless categories and qualifying criteria. The line between the most expensive tickets and the cheapest hospitality has become deliberately blurred at some clubs, while others offer a handful of cheap tickets aimed seemingly more at the annual “price of football” surveys than their fans. This is not a black-and-white argument. There are shades of grey. Some clubs are clearly better than others – some because they have to be for reasons of geography or status, others because they genuinely have a longer-term strategy. Fans at Sunderland are perhaps less exercised than those at Liverpool. Leicester fans, top of the league and with some of the cheapest tickets in the country, aren’t complaining much at all. But there is a wider issue. When there are howls of protest about the state of the grassroots game, it’s worth remembering that it is the arcane structure of the Football Association that has contributed to a legacy of underinvestment (a fact that has dawned too late on outgoing chairman Greg Dyke). When the outrage about the Fifa circus subsides because the soap opera surrounding Sepp Blatter and Michel Platini has reached a denouement, it is worth remembering that all that money siphoned off from TV deals and ticket scams down the years could have gone into football development or keeping World Cup ticket prices down. When we fall over ourselves on transfer deadline day to froth about the latest record signing, we should remember that we’re fuelling the inflation that keeps the money-go-round spinning and makes its way on to pay-TV subscriptions and ticket prices. The Football Supporters’ Federation, which organised that 2013 march that has mutated into the Twenty’s Plenty campaign and that eye-catching Anfield walkout, is mulling over its next move and will meet fans’ groups in the coming week. A mass walkout is considered risky and unlikely but there will be a range of options up for debate including targeting sponsors and clubs directly. When clubs turn fans into consumers it can be little surprise when they question value for money. 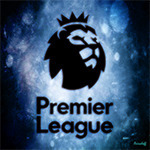 There was also irony in the fact that the Premier League chose this week to relaunch its “brand identity” at a time when bonds between clubs and fans are at their most strained. With Barclays, and its toe-curling adverts paying cloyingly insincere tribute to fans, moving on as title sponsor, the Premier League has taken the opportunity to rebrand. In a video meant to capture its essence, the colour, skill, energy, passion, community spirit and international appeal are rightly celebrated. But for those who consider the response of the 20 Premier League clubs to their outrageous fortune in taking advantage of structural shifts in the media market to trouser upwards of £8bn unsatisfactory, the soundtrack should not be the stirring orchestral swell chosen to underpin the montage but another more urgent mantra. The Guardian this week asked all 20 Premier League clubs whether they would be in favour of a £30 cap on tickets for away fans. Many clubs replied that they ‘do not take part in surveys’ but some, realising that this is an important topic for their fans, came back to us. Would you vote in favour of a £30 cap on away tickets? Why not? We are in favour of an option that would include help with supporters’ travel and that would involve the clubs putting twice as much money on the table as would be the case with a £30 price cap. The debate is around how this money should be spent. We believe there will be a very good outcome for travelling fans at the clubs’ Premier League meeting in March. Any initiatives to help make the cost of attending football more affordable? Home: Prices will be frozen on all general admission and club level season and matchday tickets for 2016-17. 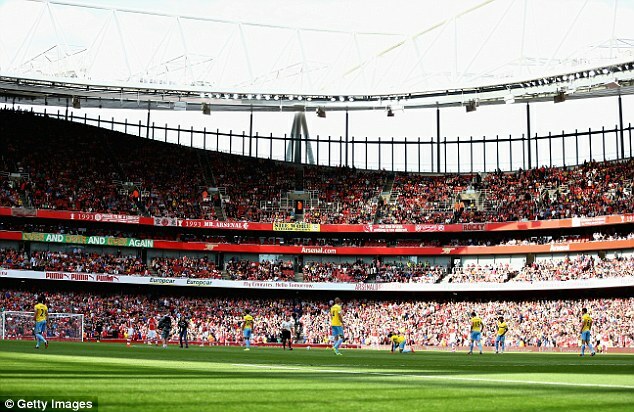 It will be the seventh time in 11 seasons at Emirates Stadium that prices have been held flat, meaning the cost of season tickets has fallen around 19% in real terms against inflation in that time. The club provides approximately 350,000 reduced price tickets a season. There is a Family Enclosure in operation at Emirates Stadium, where young supporters in the official Junior membership scheme aged 4-16 can buy tickets priced from £10. We also have an active Young Guns Enclosure in operation for weekend category B and C Premier League fixtures, with 1,000 tickets available per game for £10. Over the course of a season approximately 14,000 tickets are available for 12-16 year members of the Young Guns scheme. Away: As part of the Premier League Away Fan Initiative we have been offering a discount on our away tickets since early in the 2013-14 season. We also offer subsidised travel on difficult to reach games. For instance, the club provided £10 return coach travel to supporters for the Capital One Cup match away to Sheffield Wednesday in October. Aston Villa fans have their say. Many. Everton introduced a £95 season ticket for Under-11s for the 2012-13 season and that is still in place - equating to £5 per Premier League game. Junior season tickets (under-16s) have been frozen at £149 in the Family Enclosure (equating to £7.84 per game) and £199 (£10.47 per game) throughout the remainder of the stadium. Concessions for young people in education, employment or training (16 to 20-year-olds) brings the cost below £20 per Premier League game. In real terms, our adult season tickets are 11% cheaper than they were a decade ago. 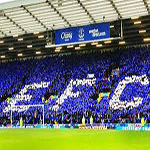 More than 17,000 adult fans at Everton pay between £23 and £31 per game. The average price for a senior and young adult season ticket has fallen from £358 in 2005-06 to £356 in 2015-16 – in real terms, a 23% decrease in price. Last season we had reciprocal away ticket arrangements with Swansea and Newcastle, and with Newcastle this season too, discounted tickets by £10 for Chelsea away and West Ham away, with our players contributing to the West Ham discount. The reciprocal deals with Swansea and Newcastle were £24-£12 and £20-£10 respectively. Over 1,000 supporters have benefitted from ‘Blues On Tour’ free coach travel. Supporters club members were offered a paid-for pie and pint at the Britannia Stadium on Saturday, and at Norwich and West Ham. Any supporter who travelled to our Premier League game against Manchester City received a free ticket for the League Cup semi-final second leg at the Etihad. Does the club have any initiatives to help make the cost of attending football more affordable? The club already uses the Away Fan Initiative money to give its travelling fans a discount on the tickets they buy – helping to tackle the issue of United always being a Category 1 match (ie with the highest prices for our fans). We pioneered reciprocal pricing (whereby clubs agree they will charge each others’ away fans exactly the same prices). We have organised several reciprocal pricing deals this season, achieving an average price for away fans of £21.25 (adults) and £6.35 (juniors). Clubs we have agreed reciprocal prices with include West Brom, Swansea, Stoke, Southampton, Everton, Watford and West Ham. We offer a number of extremely competitive season tickets deals. Our average ticket price at home, not including corporate seats, is £24.90 and we overspend on the £200,000 given by the Premier League to subsidise away travel. In terms of prices SAFC has some of the cheapest season card prices in football. In our popular Family Zone a season card for an under 16 is just £25 and an adult and junior package just £400 – which equates to just £21 for a parent and child. Even our most expensive adult season card – west stand, centre line – was only £495 for the current season (£26 a game). We introduced a special concession for under-22s, which was £190 (£10 per game) and there are also concessions for over-65s and under-16s throughout the stadium. Most of our fans pay less than £30 for an adult away ticket now after we launched our ‘Trueto22’ campaign at the start of the season. It caps adult away tickets at a maximum of £22 if they join our Jack Army membership scheme. The club subsidises the difference in the ticket price – which probably equates to around £300,000 a season. Yes – but by reciprocal deal only, so our fans get to pay the same when they travel to the reverse fixture. We have already offered £1 coach places to eight less accessible (largely non-London) away fixtures, in addition to reciprocal ticket pricing details alluded to above. We will also consider subsidising our travelling fans’ ticket prices for non-reciprocal matches, but that’s something we’ll not be looking at until the summer. Slight difference in methods of making a point apart, it is interesting that the admission price issue has blown up in Germany at the same time as in England, because football supporters in this country often hold up the German model as a fan-friendly and economically fair system for the rest of the world to follow. The Dortmund fans were angry about Stuttgart charging prices of up to €70 in the visitors end, about £55. That is high, even by English standards, though it was a cup game rather than a league fixture, not all of the visitors’ tickets were as expensive, and the prices related to seats, not standing areas. While it remains true that admission to Bundesliga games is significantly cheaper than to Premier League matches, one reason why prices stay relatively low and tickets can often be bought on the day is that many are still for standing terraces. Seats tend to be more expensive, though not usually massively so, hence the protests at Stuttgart trying to make a killing from the fans. “Football must be affordable”, a Dortmund banner read, which, if you like, is a polite, more reasoned version of “You greedy bastards, enough is enough”. Here is the nub of the issue, then. Why must football be affordable? And, perhaps, beyond that, what is affordable anyway? As Liverpool’s Ian Ayre said rather blithely in defence of the Anfield price hike, before he realised quite how serious his customers were about taking action, what is affordable to one person is different for another. All a football club needs to continue at a profit, in other words, is to keep finding 45,000 or so people willing to pay the prices charged. That most clubs have managed to keep filling their grounds when prices reached scandalous levels some years ago is a testament to either the intoxicating excitement of Premier League football or the blind loyalty of the fans, depending upon how cynical a view one takes. But from the clubs’ perspective it is no mean feat of profit extraction either. It takes a certain nerve to keep pushing prices up when the television money rolling in means that gate receipts are becoming ever more insignificant as a revenue stream, and though pointing it out feels rather like taking the Sheriff of Nottingham’s side over Robin Hood, the idea that Premier League football is so special and successful it is worth the expense has been taken further than anyone really thought possible. Even Stella Artois does not refer to its product as “reassuringly expensive” any more. But football is not a lager, or a trip to the cinema, a night at the opera or any of the other occasional treats to which it keeps being fatuously compared. The trouble with what Ayre said about relative affordability is that it goes against the grain at his own club, which prides itself (or always used to) on a sense of community and for years tried to keep prices as low as possible in recognition of the fact that the local economy was somewhat depressed. In addition to the notion of community is continuity. Looking beyond concepts such as local support or the traditional fanbase to find people who can afford to pay for seats is a short-term strategy fraught with danger. Should fashions or allegiances change and the money start to go elsewhere, the disenfranchised will not immediately return to take up the slack because the chain will have been broken. A generation will have grown up without the football habit. Anyone who imagines football is such a wonderful spectator event that crowds will always keep coming should look around most of Europe, Germany apart. Priced right, football can, to an extent, be an off-the-shelf commercial transaction like any other, though what has been unique about it over the last century or so is its family aspect. The father and son tradition, if you will, though there is no reason to exclude anyone on gender grounds. The idea that you first go to football with your parents, and end up taking your own offspring, is one of the reasons club allegiances and weekend habits are so powerful. You just don’t get the same sort of thing with supermarkets and cinemas. Football as a birthright, and later as a rite of passage, is still just about possible, but especially at the bigger clubs it can be ruinously expensive. Which, quite simply, it was never supposed to be. When Lord Justice Taylor stipulated all-seater stadiums in the aftermath of the Hillsborough disaster, he did so with the proviso that clubs should not align general admission prices with the cost of their existing seats, and felt that the modernisation could and should be accomplished without ordinary fans paying through the nose. He did not actually use the expression paying through the nose but that is what has happened, and Taylor would be extremely disappointed to see the way clubs have ignored his specific warnings. Is it too late to turn back the clock? There will never be a better time, with the television deal presently on the table. Nor are prices around £25 or £30 ludicrously optimistic, for inflation and a modest increase for seating would not have pushed them any higher. But progress will be made in this area only if clubs act together. No one is going to voluntarily put themselves at a financial disadvantage, not even Liverpool. While what has just happened in Liverpool and Boston is worth celebrating, it would be as well to remember that what has actually been preserved is the status quo, and Anfield attendees have been complaining about that for years. Prices remain far too high; an across-the-board reduction is necessary, justifiable and now possible. But clubs will act together only if they get a firm nudge from government. At prime minister’s question time, the nation’s most prominent West Ham-Aston Villa supporter has promised to look into it. Actually David Cameron should do more than that: he should bang a few heads together. There is a wrong here that needs righting. Forget the free market for a while, Dave, and do something for the common good. There might even be votes in it.